The idea that humanity would turn to cannibalism in order to survive is one that plays in all sorts of survivalist tales, from real to fictional ones which often take place in the aftermath of world killing. It's a common theme which plays as a side story in many post-apocalyptic stories but it's rarely the central idea of a movie, mostly because the result would either be a boring philosophical/moralistic debate on the pros and cons of consuming human flesh or an all out-battle between those that do and those that don't. The Day falls squarely into the latter category and the movie suffers greatly from it. Luke Passmore's script centers on a group of survivors travelling across the country in search of a haven where they can plant the few seeds they have acquired and start living again rather than simply surviving. The trio of friends have picked up a few girls along the way and the group, which used to number a dozen, is now down to their last five members with one falling rapidly ill. They take shelter in an abandoned house, the leader Rick (Dominic Monaghan) thinking they should spend the night and let their sick friend Henson (Cory Hardrict) recuperate before moving on. In staying, the group is breaking their cardinal rule and Adam (Shawn Ashmore) isn't happy about the possibility of being caught, food for cannibals who like to set up traps, but he reluctantly agrees to stay the night and the group send the ladies out to gather whatever food they can while they search the house for supplies. Turns out the place is, surprise, an elaborate trap and they soon find themselves fighting off a group of cannibals who are advancing to take down their next meal of human flesh and The Day quickly unwinds into a rather pathetic all out battle for survival. Passmore's story does throw in a few twists, namely that Mary (Ashley Bell), one of the last to join the travellers, was once the member of a cannibalistic tribe, but this bit of back story acts only as an interesting rift between the group rather than anything that moves the plot, which by this point has come to a standstill. Douglas Aarniokoski, best known for his extensive second unit work and the forgettable Highlander: Endgame, tries to keep the fighting interesting but there's only so much you can do with limited supplies and lack of imaginative kills and pretty soon the entire thing falls apart thankfully not before the leader of the "survivalists," Michael Eklund playing up the creepy, has a few choice scenes. The idea to de-saturate the picture of colour is interesting, it heightens the feeling that the world is essentially dead, but it adds little else to the story and the colour-rich dream sequences feel like they are meant to carry some punch but they fail to strike a cord. It certainly doesn't help that Ahsmore, whose character has the flashbacks, is flat and uninteresting. By far the best and most interesting of the characters is Mary and Ashley Bell exudes a great energy even when she's not talking, which is most of the time. The idea behind The Day is interesting but the movie itself lacks any sort of emotion and when your movie boils down to the good guys fighting the bad, there needs to be at least one person we can cheer for but The Day doesn't offer one up, choosing instead to end it with one survivor. Bet you can guess who that is without even seeing it. 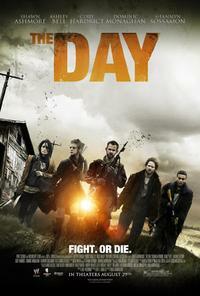 The Day is available on DVD and Blu-ray on Tuesday, December 4. DVD Extras: Audio commentary with director Douglas Aarniokoski, writer Luke Passmore and producer Guy Danella. Watched this a while ago, and while I won't dispute it's somewhat predictable plot, there certainly were a few surprises. I was pleasantly surprised by the decent production values, and keeping the tension spun up until the climax. Certainly not a bad flick, I've seen worse. The PA genre has become a beggars banquet, and this wasn't the worst of the lot.